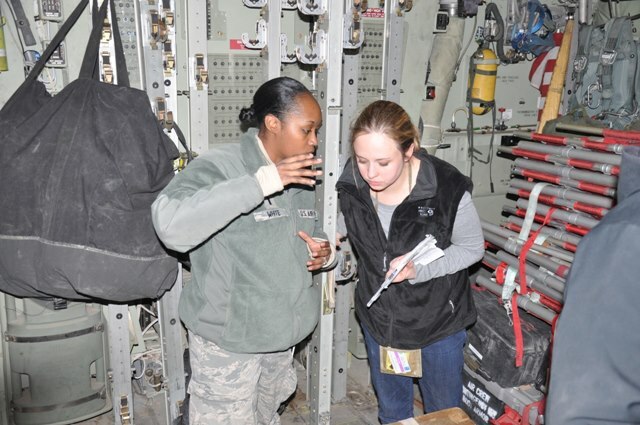 Air Force Times reporter Kristin Davis with 1st Lt. Nicole White, Air Mobility Command Public Affairs, aboard a C-130J, on an airdrop over Afghanistan. Photo by Capt. Tristan Hinderliter. NATO will continue to be in charge of media embeds for U.S. and other NATO forces after the Afghan defense ministry assumes the responsibility for embedding reporters with Afghan security forces, a NATO spokesman said. On Jan. 26, Politico reported the Afghans would take over the responsibility for embedding journalists in the coming months. But Army Lt. Col. Richard Spiegel clarified on Tuesday that reporters wishing to embed with U.S. forces and NATO allies will continue to go through the existing embed process, which is run through ISAF Joint Command. Afghan security forces are slated to assume more responsibility for the fight against the Taliban and other insurgents as most NATO forces plan to depart the country by the end of 2014.